Homelessness in Greater Washington, D.C. Please click here even if you can’t come but would like to donate. 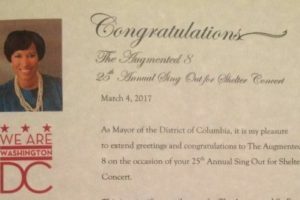 The 25th Annual Sing Out for Shelter (SOS) concert to benefit organizations that serve homeless men and women is organized by the Augmented Eight, a non-profit, men’s a cappella singing group which has performed for Washington audiences for over 60 years. This year’s concert of a cappella vocal music will once again benefit three local organizations that serve the more than 30,000 individuals who experience homelessness each year in the Greater Washington DC Region – Friendship Place, Christ House, and MMUMC’s own Metropolitan House. These concerts have raised nearly $240,000 over the past twenty-three years. In October, 2010, Friendship Place honored the Augmented Eight with the 13th annual Benjamin E. Cooper Award recognizing outstanding contributions by members of the Washington DC community to the cause of ending homelessness. The Metropolitan Memorial United Methodist Church is located at 3401 Nebraska Avenue, NW, Washington, DC, 20016, on the corner of New Mexico Ave and Nebraska Ave, across Nebraska Ave from the American University. Free parking is available in the church lot or across Nebraska Ave in the underground garage of the AU School of International Service. All of the recipient organizations of SOS are 501(c)(3) tax exempt organizations, and each will receive one-third (1/3) of the value of each ticket or donation. Your contribution above the amount of any value you receive will be exempt from federal income taxation. The Augmented Eight is an all male a cappella group that has entertained Washington audiences for over 60 years with a blend of old standards and modern pop, with a bit of jazz, gospel, and doo wop arrangements. Founded in 1946, the Tigertones are Princeton University’s signature a cappella group. For over sixty-five years the Tones have sought to maintain a culture of good friends and good music, bringing this spirit to audiences across the globe. The life of a Tigertone is one of camaraderie, adventure, and musical excellence. The group begins every year with a week in Bermuda and sings in places like Rio de Janeiro, Beijing, Paris, Carnegie Hall and the White House during the year. The Vassar Devils are a co-ed a cappella group from Vassar College, formed in the fall of 1987. Last year, they toured in California, sang for President Obama at the White House, and won the Boston Sings A Cappella Festival. In 2015, they were Northeast Regional Champions in the International Championship of Collegiate A Cappella. They have just released their newest album, Coming Alive. Their music is available on YouTube, Spotify, and iTunes. Find them online at vassardevils.com. Christ House: A full-care health recovery facility for the sick and homeless in the Washington, DC area, Christ House serves as a place of refuge and healing. Since opening in 1985, Christ House has served over 4,800 homeless men and women. Suffering from an array of illnesses and injuries including diabetes, cancer, and AIDS, patients at Christ House receive 24-hour health care as well as a full range of social services. The goal is for patients to leave Christ House with a new sense of hope and dignity and live independently in the community. For further information: 202-328-1100; www.christhouse.org. Friendship Place is a leader in Washington, D.C., in developing and implementing solutions to homelessness that have positive, demonstrable results and a lasting impact. Friendship Place offers the most effective model for addressing adult homelessness, with innovative, customized, person-focused programs that empower participants to rebuild their lives, find homes, get jobs and reconnect with friends, family and the community, permanently. Programs include street outreach, hospitality, free medical and psychiatric services, job placement, case management, transitional shelter, permanent supportive housing, and specialized services for Veterans and their families. For further information: 202-503-2963; www.FriendshipPlace.org. Metropolitan House: Metropolitan Church operates two residential housing programs – Metropolitan House located in the Metropolitan Memorial building and St. Luke’s House located at the St. Luke’s Mission Center on Calvert Street. Both provide shelter to homeless individuals who are working with Friendship Place’s AimHire program. St. Luke’s House and Metropolitan House were two of the first shelters to open in upper Northwest DC, and over the past twenty-five years they have provided safe, stable, and secure living environments that have empowered hundreds and hundreds of men to move beyond homelessness toward self-sufficiency, employment, and permanent housing. In 2015, Metropolitan House shifted its focus from serving men and now houses women. Both programs emphasize independent living and have expanded from the older night-shelter model of “in- by- 7am-out-by- 7pm” to offer residents 24-hour-a-day access. This accommodates the varied schedules of those who are working or seeking employment. For more information call 202-363-4900 or visit www.nationalchurch.org. All of the beneficiaries of SOS are 501(c)(3) tax exempt organizations, and each will receive one-third (1/3) of the value of each ticket or donation. Your contribution above the amount of any value you receive will be exempt from federal income taxation. The Augmented 8, a 501(c)(3) charitable organization, chartered in Washington, DC. Sing Out for Shelter (2014) Hits Highest Note Yet! Washington Society for Close Harmony Singing, Inc.
© 2019 · Washington Society for Close Harmony Singing, Inc.